“Never judge a suburb community until the trees are taller than the houses,” is one of my mantras. Recently, I was visiting a friend’s parents in Lakeview (perhaps best known as the home of Calgary's illustrious former Mayor and Premier, Ralph Klein) and couldn’t help but be in awe of the Lakeview’s urban forest, especially the majestic coniferous trees. It felt like I was in a mountain village, yet I was only 10 minutes from Downtown. Amy Lonsberry, Community Association President likes to point out that there are many examples of multi-generational families living in Lakeview i.e. grandparent, parents and children all living in Lakeview. “We have a tremendous sense of community pride and loyalty” she exclaims. Lonsberry recently attended a presentation by Dr. Katherine Loflin, of the Knights Foundation whose research on communities shows that while schools, grocery stores and safety are important to making a community an attractive place to live, the three most important elements are: social offerings, aesthetics and places to meet. The Community Hall and the surrounding field house, park, playground, soccer fields, community garden and outdoor rink are the heart and soul of the community. Lakeview is also home to an amazing array of wildlife from bears to bobcats to skunks and raccoons, even the occasional cougar. They even have their own resident bird watcher, Terry Waters who reports monthly on what birds have visited or taken up residence in the community. I noted that 12 robins visited one bird feeder on January 3, 2013 and that they may or may not have a resident Great Horned Owl. This is not surprising as the community borders on two larger parks North Glenmore Park and Weaslehead Flats. The community offers everything from modest 1960 bungalows to brand spanking new mansions. After 50 years, many of the homes are undergoing major make-overs. Lakeview village the estate area is currently home to many multi-million dollar new home developments, both in modern and traditional architectural styles. While taking our friend’s parent’s dog for a walk, I was impressed by the many little pathways between the houses leading to hidden pocket parks with retro playground equipment. 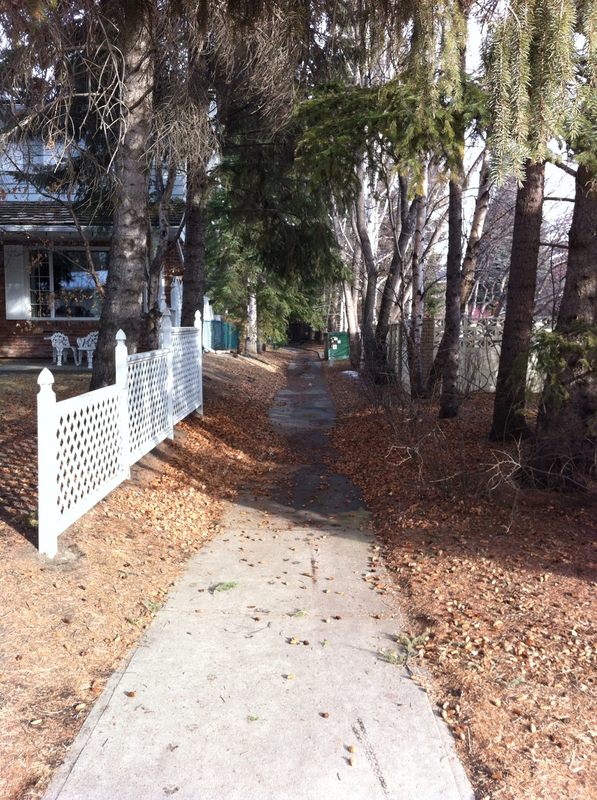 These little pathways and parks further added to the mountain village charm of the community. Lakeview Plaza built in the ‘60s sits almost in the middle of the community and is the only shopping destination. It fell on hard times in the ‘90s and they almost lost their grocery store. However, today the plaza has had a face-lift and now is a very attractive shopping centre with Sobey’s as its anchor. It is also home to a bank, a pharmacy, new tenants like Bella Roma Pizza, Meez, Caffe Perfectto and established ones like Lakeview Bakery. In many ways, Lakeview Plaza is the model for the ‘80s Glenmore Landing and the new Aspen Woods shopping centres. However, not everything is rosy in Lakeview, as the community is struggling to understand what will be the impact of the Calgary Ring Road on their community. However Lonsberry says the upside is that it has made the community strong and gotten people to talk about how important community is in Lakeview. Lakeview a '60s community is blessed with numerous pathways to hidden pocket parks and playgrounds. After 40 years, the trees have matured to create wonderful canopies. Example of the wonderful secret parks/playgrounds that are completely removed from the street. Example of retro playground equipment from the '60s. I am lucky enough to have 3 of these in my garden at home. Love that our 2 year old neighbour child has discovered them and wanders over to play on them. Sample of original homes in Lakeview estate area. Sample of new infill homes, where old home has been knocked down and new modern home constructed. While not all in favour of this, it is healthy to have the next generation invest in established communities. It is part of a healthy evolution of a community.